A floral head dress is a lovely way to add flowers to an outfit without requiring a woman to carry them or attach them to her clothes. Many brides choose to wear floral head dresses if they are having less formal ceremonies, and many junior bridesmaids and flower girls enjoy floral head dresses because they do not have to keep constant watch of where their flowers are or if they are still in a nice condition. For the most part floral head dresses are worn as garlands just off the crown of the head, though some women also consider flowered combs, clips and even headbands to be floral head dresses as well. A garland head dress is simply a circle of craft wire shaped just around the outside of the crown of the head. This allows the head dress to sit comfortably on the head without slipping or falling off. 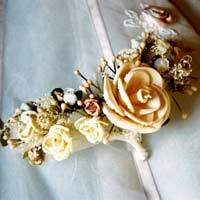 But being worn in the hair all day is no easy job, so only sturdy flowers should be chosen for this type of arrangement. Roses and carnations in particular work well in floral garlands. Prepare the flowers by removing any thorns, shoots and/or leaves from the stems. To create a lovely floral head dress simply wrap the circle of craft wire in floral tape, cut the stems of your chosen flowers to about 1.25 centimetres and use a dab of hot glue to affix the stems to the wrapped wire. Secure the stems firmly to the wire with decorative ribbon and fill in any gaps between flowers with baby's breath or greenery. Affix the ends of the ribbon to the garland or wrap and tuck the ends under. Simpler options for floral head dresses include combs and clips. Again, sturdy flowers are best for these items so roses, carnations, and wider flowers such as sunflowers and gerber daisies are all options. To make a floral comb or clip begin by creating your floral design, possibly adding bulk by including ivy leaves, and wire the arrangement together so that it becomes one item. Affix this arrangement to the comb or clip using glue suitable to the material of the clip (for example, for plastic or metal). Use wire to further secure the arrangement to the comb or clip and then cover any unsightly details with decorative ribbon. Floral head bands are not as common as garlands or combs and clips, but they do remain a possibility for women who prefer this style. Because a head band is worn close to the head and literally holds back the hair, using silk flowers is often the best option. Select a wide head band so that there is plenty of foundation for the flowers and wrap it in decorative ribbon. Use a dab of glue to secure each flower directly to the band (discard any plastic stems or underpinnings that come with silk flowers). Consider adding small sequins, crystals or other baubles to add some depth and greater visual interest to the arrangement. Floral head dresses allow women to add flowers to their outfits without having to sacrifice their clothing or a free pair of hands. Garlands, combs, clips and headbands are all options for women and girls interested in making and wearing floral head bands.